Major studies from the 2018 AACR Annual Meeting were the KEYNOTE-189 trial and Checkmate-227 study. These studies, in combination with several others, paved the way for the numerous approvals pembrolizumab gained from the US FDA in 2018* for cancers such as hepatocellular carcinoma, non-small cell lung cancer, urothelial cancer, large B-cell lymphoma and metastatic cervical cancer, whilst nivolumab and ipilimumab gained approvals for cancer types including advanced renal cell carcinoma. A few months on and the ASCO Annual Meeting yielded yet more noteworthy data – namely the TAILORx trial, which demonstrated that most women with a specific early-stage breast cancer and a midrange score on the Oncotype DX® text do not need chemotherapy after surgery, these practice-changing results are expected to spare thousands of women from the harmful side effects of chemotherapy. 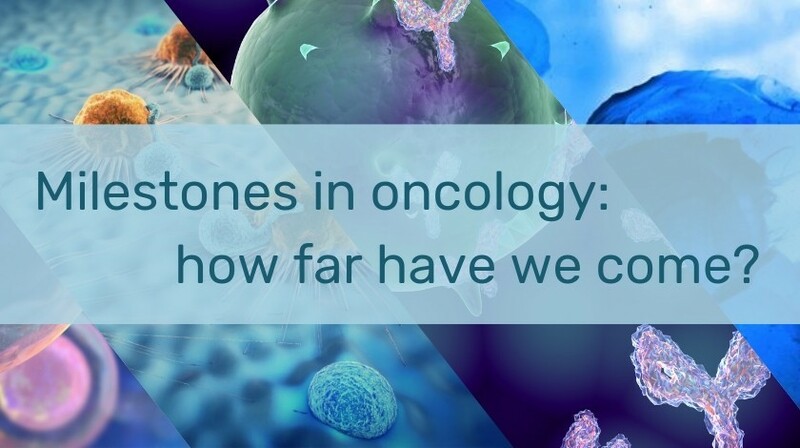 To see just how far cancer research and discovery has come over the last 50 years we have collated the key milestones into an interactive timeline, scroll the timeline to gain a visual snapshot of oncology from 1979 to the present day. Working back from early 2017 to the present, we have seen several key advancements in the field of oncology. First up, genomic medicine has come on leaps and bounds in 2017. Earlier in the year we spoke with David Bentley from Illumina about the 100,000 Genomes Project; an initiative aimed at creating a new genomic medicine service for the NHS – transforming the way people are cared for. Since that interview, we have seen several further advancements in cancergenetics; most notably the ground-breaking study in which researchers discovered 72 new breast cancer gene variants, nearly doubling the total number of known variants associated with breast cancer. Preventative research has also advanced considerably. Of note, researchers recently took a major step toward one of the hottest goals in cancer research – a blood test that can detect tumors early. The test termed CancerSEEK can identify eight of the most common cancer types, by measuring circulating tumor DNA from 16 genes and eight protein biomarkers. Find out more here. Immunotherapy was at the forefront of these advancements and 2017 saw a wave of FDA approvals, of these Keytruda® (pembrolizumab) and Kymriah™ (tisagenlecleucel) were the most remarkable. Pembrolizumab was approved in May, making it the first cancer treatment that is prescribed based on the genetic characteristics of the disease and not the location of the tumor. Later on in the year, the first CAR-T cell treatment, tisagenlecleucel, was approved for some young people with leukemia. In order to explore the key themes in immuno-oncology, we hosted a free 2-day online educational symposium. The insightful event covered key areas such as rational combinations of immunotherapies, management of therapy-related toxicities and asked what is next for immuno-oncology. You can watch all of the talks on demand here.